@sirLeone I’ve got it working in the meantime. The only thing I still haven’t figured out is how to get reading of Total power in OH. Regarding your issue: have you tried the latest release (0.5.1)? Is there a way to read out the modbus with an esp8266 or arduino and send the data with wifi to the openhab-server or the raspi running the software from the first post? I have seen some tutorials where you can build a modbus slave with an esp8266. Would this be the right thing to do this? Can i use your software with this lan-adapter? Can i read out a sdm630 connected to this and my raspi is only reachable over lan? You can hook an esp8266 with a modbus adapter to the energy meter. I especially use Sonoff’s with Tasmota firmware. In the latest versions it supports all Eastron meters and also some Peacefair energy meters. If there are more Tasmota(MQTT)/Eastron users out there maybe we should start a new topic and leave this one only for Raspberry/Eastron use cases (the RS485 adapter placed on the Raspberry itself). Interesting. I am looking for alternatives for Power Metering. My electrical box setup is triphasic, I was thinking to buy the SDM630, but I do not know how to setup the RS485. You are talking about sonoff with Tasmota. Is it possible to link the a sonoff with Tasmota to the SDM630 send data via MQTT? How is the wiring? and how you modify the firwamre? I am Tasmota(MQTT) user and I am thinking to buy a SDM630, I am interested on this topic, but I need to make up my mind about how is everthing setup. this is the RS485 module you must use. this is connected between the sonoff and the Eastron meter. the basic idea is that the sonoff/Tasmota takes the readings through RS485 and then transmitts MQTT status messages. Cool that is what I was looking for. I will have a look. Next January will arrive my Eastorn an I will start to test it. I guess that with Sonoff Basic the conection is the same. But I do not know how is the setup when you get in in the local IP of the sonoff. 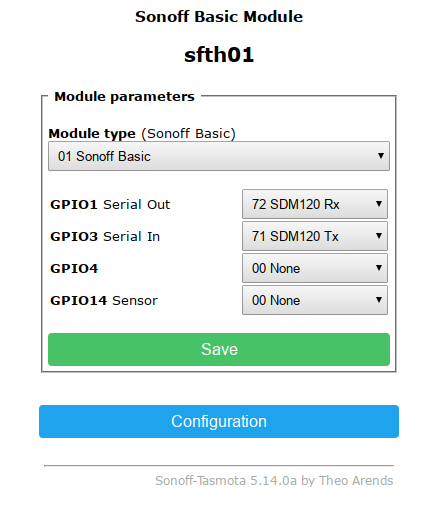 How to setup sonoff basic? The Tasmota module configuration is the easiest part. It has pin configuration options for Tx/Rx on SDM120/SDM220 (single phase meters) and seperate pin options for SDM630/SDM530 (these are the 3-phase models and display more registers). Today I got my SDM630. 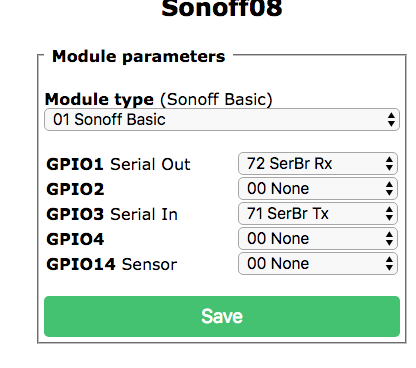 I have flashed a sonoff Basic, and I set it up like this, but I do not see any values on the main page of Sonoff-. What do I miss? I do not find on the menu, SDM630 Rx and SDM630 Tx. The library SDM630 was commented with // as a comment. Or you can download the ‘sensors’ Tasmota release which has it ready to play. sonoff-sensors.bin = The Sensors version without Wps and SmartConfig configuration but adds even more useful sensors. The TotalEnergy is possible to reset to 0? How I get the ActivePower. It seems that is a String? the best way to use it is to set a database persistence and store your daily metering. you will see that the SDM’s TotalEnergy has little use, you can do this from your data. For your second question. This string is JSON data. You need to setup the things and items scheme for OpenHab to parse the data. Luckily, i have my setup for both MQTTv1 and MQTTv2 bindings so here it is. as you can see, i also have all the UoM set for ease of use on calculations etc.